Please make sure you use the same email address for registration that you used last year to avoid duplicate accounts for your family and that your player's history remains in tact. If you no longer have access to your old email address, please contact the . PLEASE DO NOT ATTEMPT TO LOG IN WITH A NEW EMAIL ADDRESS. This will create an entirely new duplicate account and you'll lose access to all of your family history. 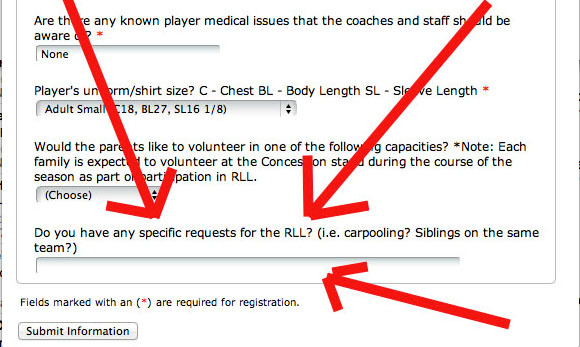 If you have never registered a player with RLL, then follow these instructions exactly. Select the division for which you want to register a player. The registration groups (located on the registration page) are designed to allow you to register a child in a division that meets their requirements base upon their birth date and gender. Please pay attention to the description of the division that you've selected as some require players to go through assessments. Click the "Begin Registration" button to select a division. Verify that you have selected the desired program and then click the "Continue" button. They system will prompt you to log in. Click the create account button. The system will email you a link to establish a temporary password for our system. When you receive the email, click the link to set up a password. Once you've established a password, return to the login screen and enter your email address and password. If you've done everything correctly, you'll be presented with any additional information the form requires, such as uniform size, health information, etc... Please answer all questions. The system will provide you an option to use PayPal to use a credit card to pay for RLL fees. Please make sure that you follow all onscreen instructions. Parents often like to make special requests such as having a player place on a specific team for carpooling or to play with friends or sometimes preference for a specific coach. These requests will likely not be granted. It is very difficult if not impossible to take in the hundreds of requests we get and to build teams and a schedule that accommodates everyone's wishes. In the more competitive divisions, we have a blind player draft process that helps to ensure an even and fair distribution of players. It is very difficult in these divisions to accommodate parental requests as we are quite often accused of "stacking" teams by... parents! Having siblings placed on the same team, providing both are of LL age and capabilities of playing at the same division level, is about the only request that we might be able to accommodate in the team building and scheduling process. 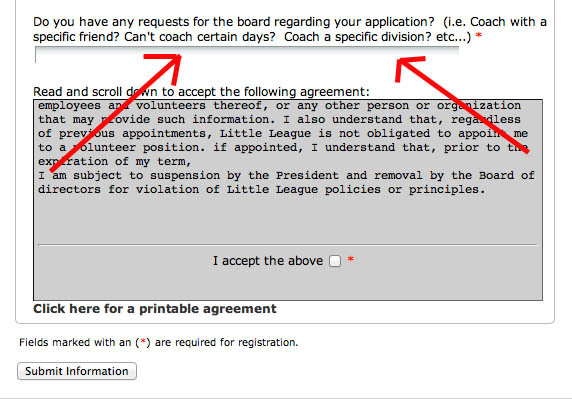 Having said that, you may put in your request on your player's registration form in the "specific requests" field. This is the ONLY place for the request. If you put your request in the proper place, it will be see by those board members responsible for the team building and scheduling process. Please do not email the information officer with your request as it will go in the trash folder never to be seen. Parental participation at the concession stand is expected. Each team is assigned one or more “shifts” at the Concession Stand during the regular season. We ask for four volunteers from each team to work the entire shift, which minimizes our training times, and keeps food moving as quickly as possible to the parents and Little Leaguers. Please remember that since we do have some “hot” equipment in the Concession Stand, we would prefer for volunteers to be 16 years old. Most shifts are scheduled on a night when your Little Leaguer does NOT have a game, so you don’t have to miss their first Double-Play or Home Run! Coaches must fill out the volunteer application form and go through a background check. Each team is allowed one head coach and a maximum of two official assistant coaches for the minors division and higher. T-ball and Jr. Minors visions will allow additional assistant coaches. Coaches will be required to attend a coaches safety meeting usually held in April. Coaches often like to request to coach with a friend as so forth. These requests we usually granted as our coaches are volunteers. There is a place on the volunteer application form for coaches to put in their specific requests. If you put your request in the proper place, it will be see by those board members responsible for the team building, coaching lists, scheduling process. Please do not email the information officer with your request as it will go in the trash folder never to be seen. The RLL uses paid umpires during the season. We have the one of the most generous payment schedules in the area for umpires. Kids Little League age 11 and older are allowed to umpire divisions that their age will allow. Kids must have their own separate and unique email address assigned to their account. In addition, if they have a cell phone, please make sure their cell phone number is listed in their account as we need reliable communication methods to reach our umpires. They must be reliable and show up to games on time and ready for action. Nothing is more frustrating in Little League as when an umpire does not show up and no one can play ball. Minor umpires are expected to attend the umpire training meeting in late March. Umpires cannot log into the umpire's corner section of the website until they've been assigned special permission from the Umpire Coordinator or Information Officer. These permissions are not assigned until mid to late March. Adult umpires must fill out the volunteer application form and go through a background check. Coaches are issued a base set of equipment appropriate for their division. This includes some basic batting helmets, bats, catchers gear and balls. At a minimum, your player will need a baseball/softball glove appropriate for their size. Starting with minors softball, your player will need a face guard/shield for protection. Please review the size chart to help you select the proper size for your player. Uniforms are distributed in April just before the regular season begins. For baseball, uniforms consist of shirts and hats. For softball, uniforms consist of shirts and socks. Rockford Little League Baseball/Softball is for all youngsters between the ages of 5 and 18 years of age. In RLL, baseball is for boys and softball is for girls. Players must be Little League age 5 or higher due to Little League insurance rules. *NOTE: Late registration begins on February 15th. A $10 late charge fee will be applied for each late registration. If fees are not paid at time of online registration, registrant will be automatically wait listed until payment is received. You may also mail checks payable to RLL. Prior to March 1st, refunds are available minus any credit card transaction fees, late fees and any applicable multi-child discounts. After March 1st, no refunds are available except for medical injury circumstances (broken bones, etc...). Prior to May 20th, refunds are available minus any credit card transaction fees, late fees and any applicable multi-child discounts. After May 20th, no refunds are available except for medical injury circumstances (broken bones, etc...). You must reside within the RLL territory to play in the Rockford Little League. The system will check your address during registration. If you fall outside of our boundary, you may apply for a waiver. It may or may not be granted depending upon circumstances. Please contact the if you have any boundary issues. *These are KEY skills that coaches are looking for. There is an opportunity for players entering their last year of their respective division (as allowed by Little League age) to attend assessments and possibly play up at the next division level. For example, a player from the t-ball division (5 & 6 year olds) who is Little League age 6, could sign up for and attend assessments to see if they could possibly play up at the jr. minors division level. After the assessments, the VPs of Baseball, Coaching Coordinator and Player Agent will review the evaluation data, approve the player's option to play at a higher level. For the draft players, evaluation data will be given to the coaches for the division drafts. Thus, if your player will be attending assessments, you MUST sign your player up for an assessment time slot. Assessment registration pages are located toward the BOTTOM of this page. Softball assessments are for players in the draft divisions of softball only. Our VP of Softball will send out a spreadsheet with assigned timeslots. There is no online registration for softball assessments. For players in the T-ball, Jr. Minors, and Minors divisions, there is an opportunity for players entering their last year of their respective division (as allowed by Little League age) to possibly play up at the next division level. For example, a player from the jr. minors division (7 & 8 year olds) who is Little League age 8, could place a request to see if their player could play up at the minors division level. Rdquests need to be placed on the player's registration form during registration. You may also contact our VP of softball with such requests. Teams cannot be assembled until we have our coaches registered, background checks completed, players registered, player assessments completed, and for some divisions the player draft completed. Since player assessments do not complete until sometime in early March, it stands to reason that team information will not be available until sometime in mid March. Furthermore, it stands to reason that the practice and game schedules cannot be created until sometime after the teams have been assembled. Hence, the practice schedule becomes available sometime between the player drafts and the first practice (late March). The game schedule comes out sometime after the practice schedule but before uniform pickup (mid to late April). For the lower divisions, practices usually starts late in March and runs into mid to late April. Teams practice two times a week, weather permitting. Practices typically start around 6:00pm during the work week for most divisions. Practices can start as early as 5:30pm for the T-ball and Jr. Minors divisions during the work week. Practices can also be scheduled on the weekend (Saturday). The higher divisions (Seniors & Big League), start much later than the lower divisions -- usually after the highschool baseball/softball seasons have ended. The practice season for Seniors and Big League usually starts in May. For the lower divisions, regular season begins late in April and runs through late June depending upon the division. Teams usually play two games per week, weather permitting. We try to schedule make-up games if necessary. We try to schedule certain divisions such that it minimizes conflicts with travel baseball/softball. Games typically start around 6:00pm during the work week for most divisions. Games can start as early as 5:30pm for the T-ball and Jr. Minors divisions during the work week. The higher divisions (Seniors & Big League), start much later than the lower divisions -- usually after the highschool baseball/softball seasons have ended. The regular season for Seniors and Big League usually starts around the beginning of June. Allstar teams are formed for certain divisions based upon the recommendation of the coaches. Rules are strictly enforced during tournament play -- ages, boundaries, Little League approved equipment, etc… Allstars can play many games per week depending upon the dynamics of the participating leagues. Scheduling information comes out at the last minute so it is often difficult for parents to plan. Allstar games usually begin in early July and can run all the way through the end of August or even into September depending how far a team goes.